Just in case you’ve been living on a desert island for the last two years, allow us to catch you up: Voice interfaces are the latest tech trend and they’re showing up everywhere, from smartphones to smart speakers. As of Tuesday, even your favorite DVR is getting in on the voice action: TiVo is adding two new products to its Bolt line up, with the Bolt Vox, and Mini Vox, confirming earlier rumors. Both devices come with TiVo’s new Vox remote, with a nearly identical layout to previous Bolt remotes except for two notable additions, including a prominent light-blue microphone button, and — for the first time on a TiVo remote — a dedicated Netflix button. The TiVo Bolt Vox, with up to 4K Ultra HD resolution, which includes four integrated tuners starts at $200 for the 500 GB model. You can also choose a larger 1TB model for $299, or go for the gusto with the top of the line 3TB model at $499. The TiVo Mini Vox, which is a companion to the Bolt Vox, letting you access content at up to 4K Ultra HD resolution on other TVs in your home, is $180. You can also buy the Vox remote (available in black or white) on its own for $40. It can be used with existing Bolt boxes as-is, or with TiVo Mini and Roamio set-top boxes — but these require an additional Bluetooth module, bumping the price to $45. The voice commands also work with playback control, with commands like “Skip it,” which will automatically jump you past the ads on a recorded program. Speaking of skipping, you’ll find three new buttons on the Vox remote: A skip button (previously you had to use the “D” button to skip ads), a Netflix quick key — another Roku-inspired move — and of course the microphone button, which you need to press to initiate a voice command. 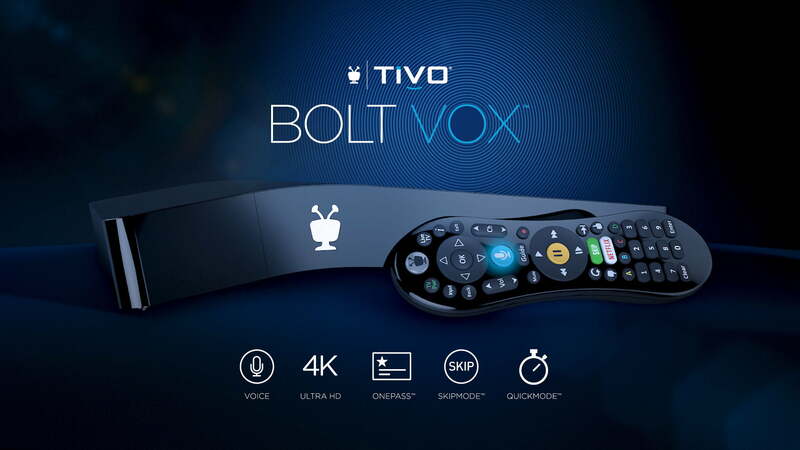 Bolt Vox and Mini Vox users will also benefit from TiVo’s latest user experience update, which makes it easier to see what’s streaming on each TiVo box in your home, while also improving some of the personalization features.